Our local Marriott has a built-in restaurant called the Great American Grill. Maybe they all have them...I wouldn't know. Marriotts aren't usually in our budget when we're traveling, but the diner is really quite good. At least for breakfast and lunch! 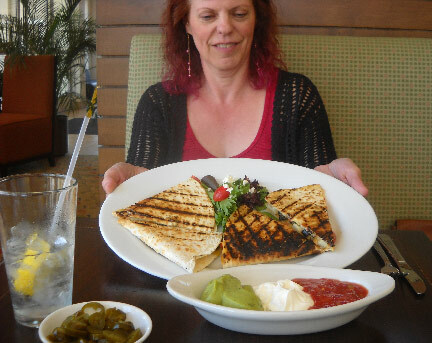 Here's my quesadilla...that's a mouthful, huh? A lot of it went home with me.